Social work has become a business. The traditional distinction drawn between social work as a non-commercial activity in the public and voluntary sectors of the welfare state and private commercial activities driven by the market's profit motive has largely disappeared. 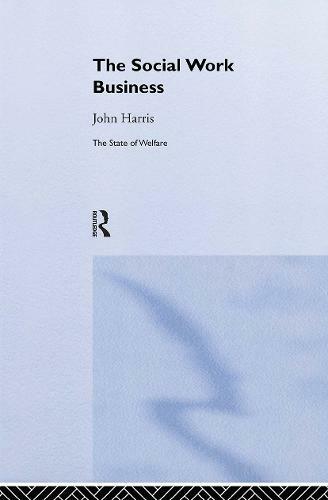 In The Social Work Business John Harris addresses the introduction and consolidation of business thinking and ways of operating in social work and considers the consequences for service users, carers, voluntary organisations and social workers. The book traces the development of the social work business from its establishment under Thatcherism to its modernisation under New Labour. It looks in detail at the use of capitalist sector methods - the heightened use of surveillance, the increase in managerial control, changes in work practices - and how this is being reflected in social work education. The Social Work Business provides a radical reappraisal of the far-reaching changes the profession has undergone. The sources of uneasiness experienced by many social workers, faced with a transformation in the organisational culture in which they work, are thrown into sharp relief and opened up for debate. "Social work is the pre-business era, according to this book, was free to set its own agenda. Then came the neo-liberal policies of the Conservative governments in the 1980s and 1990s -- through community care policies, managerialism, performance indicators and the like. Although the story has been told before, no other book has pursued this makeover -- the complete inversion of social work's aims -- so rigorously and in such detail.."